AUTEUR ARIEL: Meet Samson + Furry Friend Tag VIDEO! 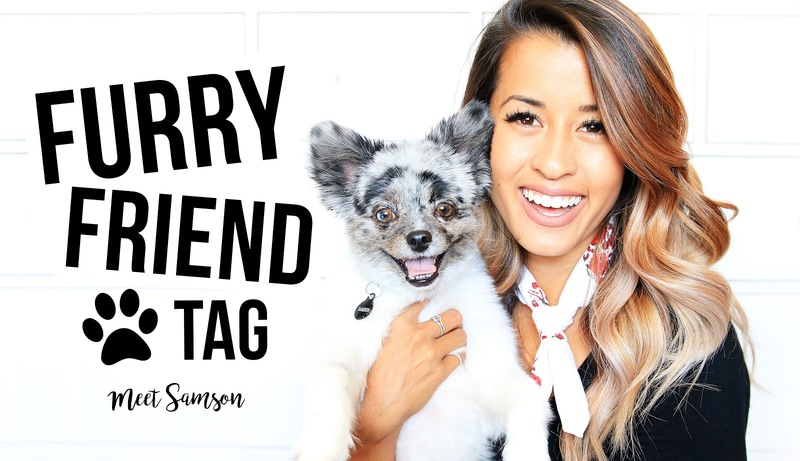 Meet Samson + Furry Friend Tag VIDEO! Most of you who follow my blog already know my pup Samson pretty well! But for those of you who don't (or for those of you who want to get to know him better), today's video is just for you! We're doing the Furry Friend Tag, where I answer a bunch of questions about Samson! I hope you guys enjoy getting to know this little flufferton a little better and I know I've said this a MILLION times already but I promise, I will start BLOGGING AGAIN really soon! WANT MORE OF SAMSON? Watch these videos below! I'm glad you're so open about how you got Samson. I know, like you said, a lot of people are persistent that it's either adopt or NOTHING. We tried adopting at first and a lot of the dogs we went to look at were "pending" or it just didn't work out. In the end, we ended up buying as well and I can say no matter HOW we would have brought home a dog, it would have been the dog itself and the relationship that really stuck with me the most. ANYWAY (sorry for the rant), Samson is just adorable and his puppy picture is SO CUTE. Love how he kept trying to high-five you!